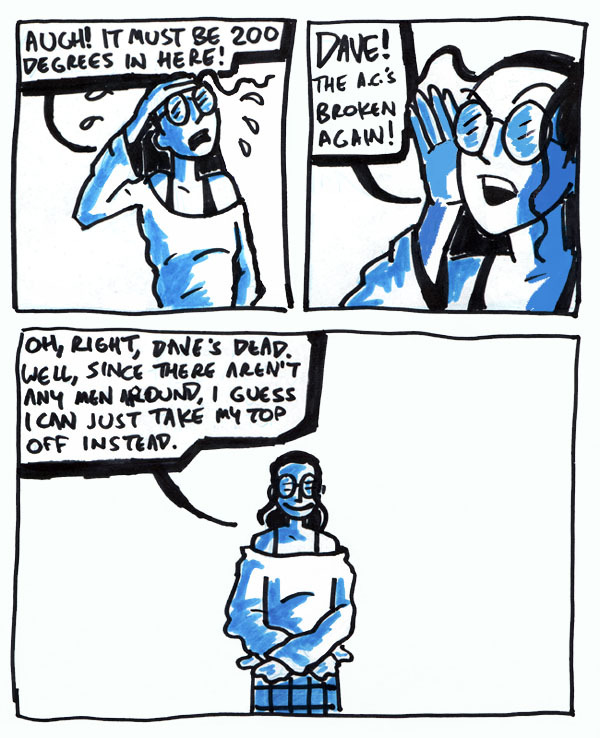 Back again for another guest strip. I’m re-reading this for the first time since I drew it, so I’ll just make comments page by page and see what happens along with the rest of you. The lettering’s pretty dodgy here, but the coloring’s pretty decent considering the cheap markers I must’ve been using to do the job. Once again, decent coloring, terrible lettering. I should’ve made some attempt at plotting this before writing it in Sharpie, and you’d think the son of an English teacher would at least put an asterisk somewhere that made sense. Note that Angelina Jolie was in her “Tomb Raider” shorts here, and not yet in her African explorer shorts. You sure pick up a lot from glancing at Enquirer and People headlines at the supermarket. I’m drawing Willie Nelson again? Awesome! Apart from The Red Headed Stranger’s sheer awesomeness, Mr. Nelson was an occasional headliner at the Lorain County Fair, which took place in my hometown of Wellington, Ohio. By all accounts, he gives a great performance no matter what the venue is, and everyone who drank with him at Fort’s Tavern spoke very highly of him. 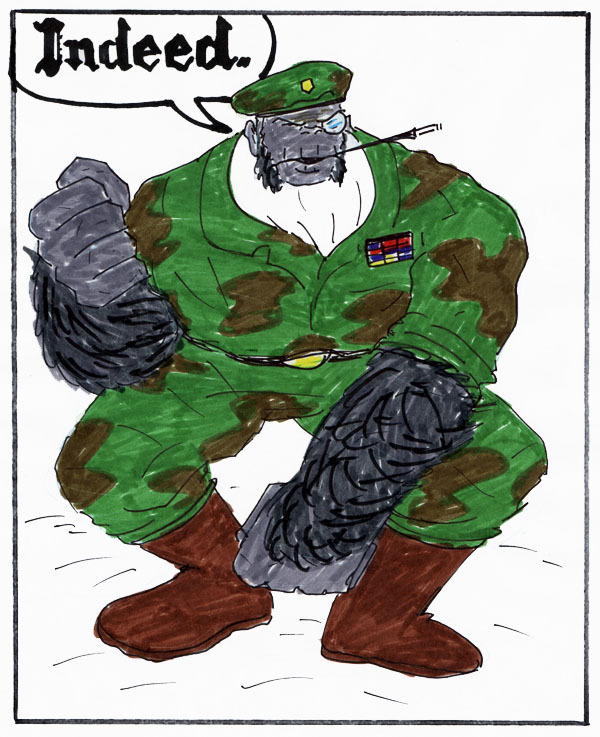 And this, of course, is Willie Nelson’s arch-nemesis, Atilla Gorilla. This is one of the best character designs I’ve ever done, and I’ll have to make a point of using him again somewhere. I wonder if William Bazillion has any room for a talking ape in his crew? “Prepare to pay all debts in full, Nelson!” is a pretty good line. I approve of Past Me’s decision to make Atilla Gorilla speak in a calligraphic font. I disapprove of Past Me’s lack of at least using a ruler to line up his text, his shoddy lettering, and his complete lack of backgrounds. 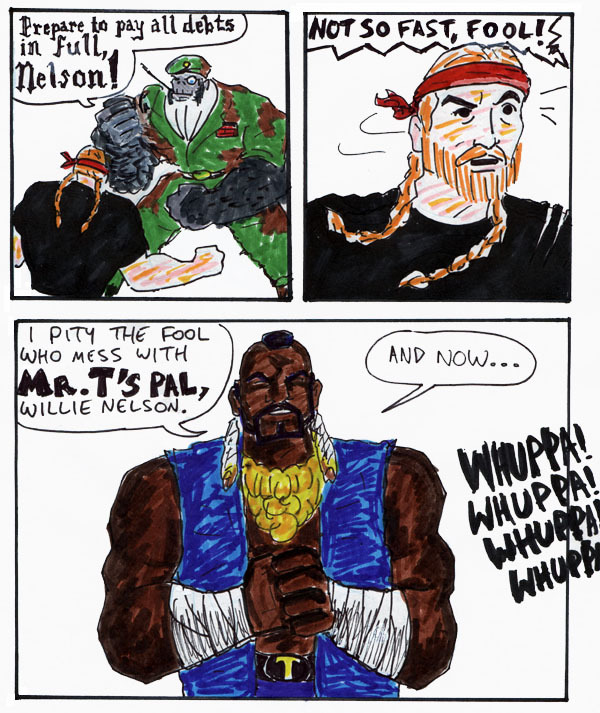 But his use of Mr. T makes up for a lot of that. 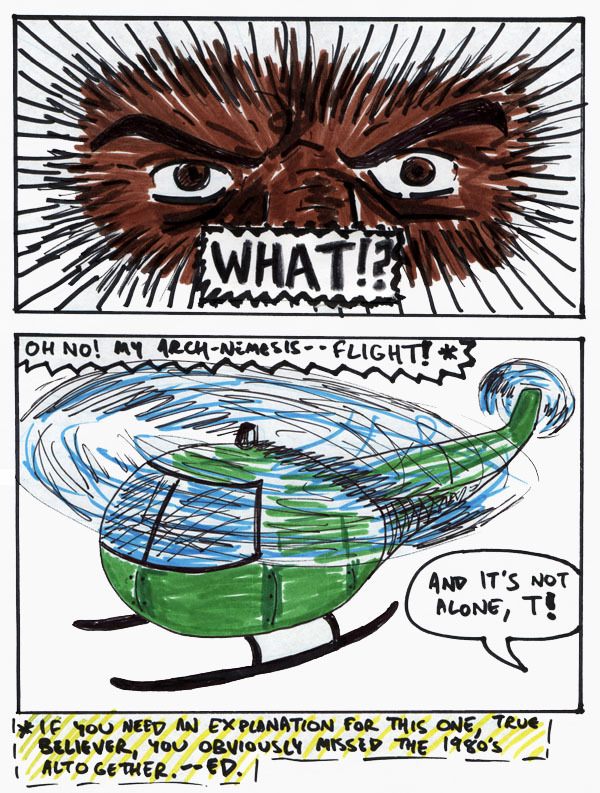 Mr. T’s arch-nemesis being the concept of flight is pretty good, isn’t it? I should’ve had some drugged milk somewhere in the story, though. Oh no! 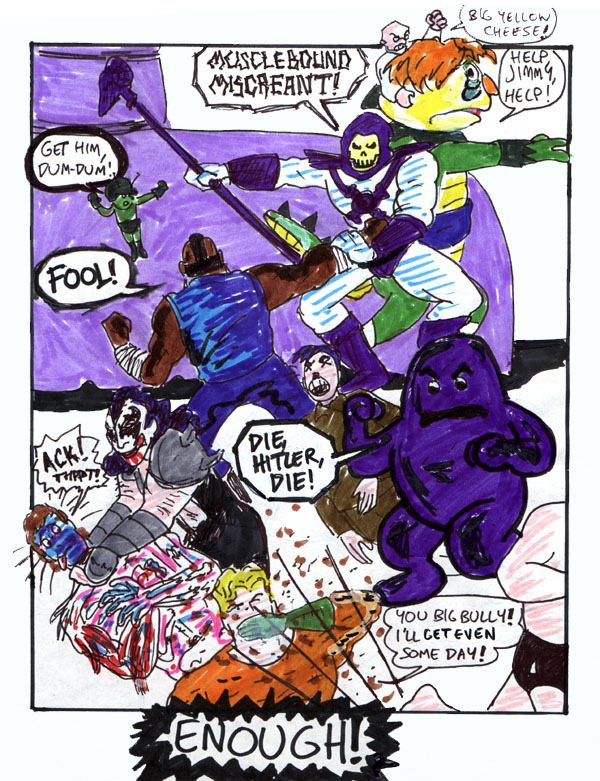 It’s an all-star assemblage of some of the most dangerous villains in the world! 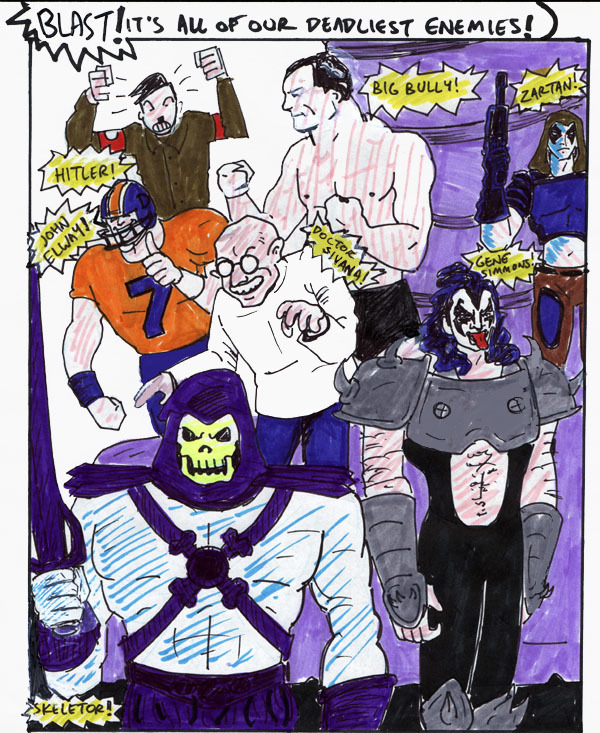 Hitler is, of course, one of the villains from The Chronicles of William Bazillion; Big Bully (aka “You Big Bully”) is the jerk from the Charles Atlas ads; Zartan is one of the completely rad villains from the G.I. Joe toyline, TV show and comic book series; Gene Simmons is the nightmare-inducing lead singer of KISS; Skeletor (from Masters of the Universe) is the most ineffectual and least scary villain of all-time, which is no mean feat considering that his face has been ripped off and he’s got a glowing, evil skull for a face; Doctor Sivana is the arch-nemesis of the original Captain Marvel; and John Elway traumatized me and every other Cleveland Browns fan two years in a row in the late 1980s with “The Drive” and “The Fumble” forever etched into my brain as a result. My updated list of villains would probably be prominent Republicans, for the most part, although that probably seems too obvious. And here is the Milk reference. Good job, Past Me. Good Guy Roll Call: The Great Gazoo, voiced by the legendary Harvey Korman, was the sign that the writers of The Flintstones had officially, completely run out of ideas (and considering the show was initially conceived as a knockoff of other, more popular television shows, that’s really saying something); Optimus Prime is the leader of the Autobots, as seen in the Transformers TV show and comic books, and, to a lesser extent, the recent live-action movie, which I somehow managed to not see this past summer (and of course, I’d never, ever include Beast Wars as a legitimate Transformers cartoon–Prime is a semi truck, *not* a gorilla, dammit); Grimace, from McDonaldland, works better as a villain, and really shouldn’t be in this lineup; H.R. Pufnstuf is from the Sid and Marty Krofft show of the same name, and was a very brief obsession of Shaenon’s and mine; Aquaman’s right to be annoyed, since he’s a legitimate, card-carrying member of the Justice League; Jughead is the King of Archie Comics-land, hence the crown; and despite my best efforts, children’s show oddity and producer of untold nightmares, Slim Goodbody has still not successfully re-entered the public consciousness. Shaenon did this one, and it’s one of her rare early computer coloring efforts. Looks like it fits into the “Narbonic Characters as Superheroes” Sunday comics storyline that she never got around to doing since the Victorian storyline and Jeffrey Wells’s “Brief Moment of Culture” both took many, many more Sundays than she’d anticipated. A scene not unlike the Muppets vs. John Denver’s Ghost vs. everybody else melee that took place the last time I did a Sunday strip. 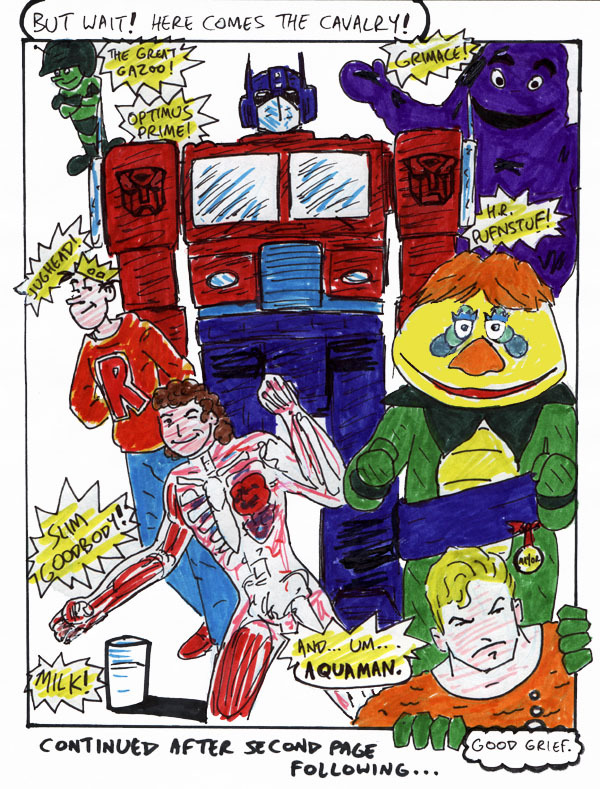 This scene plays out pretty much exactly as it would if all of these guys really got together, except that Optimus Prime should be in semi mode chasing down John Elway. And Marvel Comics’ Galactus makes an appearance. 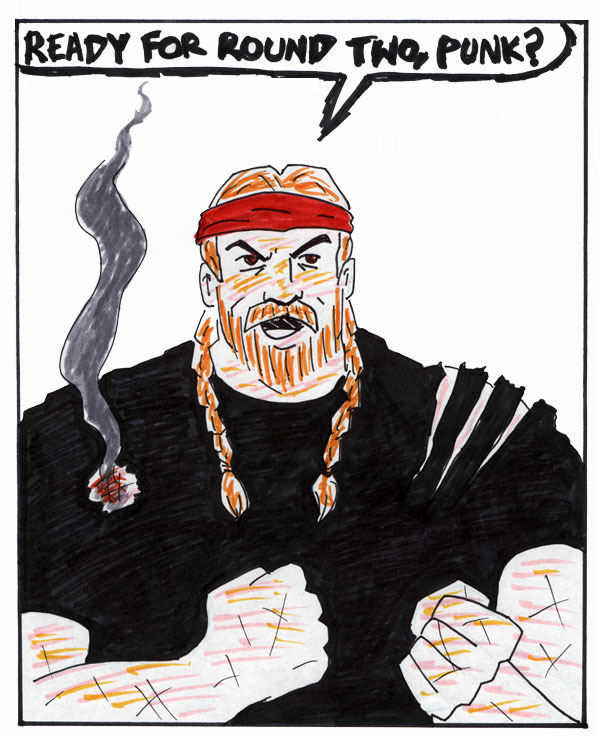 Galactus wouldn’t actually destroy Willie Nelson, though–they’d almost definitely team up, and Willie would probably end up as Galactus’s new partner. The last panel, of course, is an homage to Winsor McCay’s Little Nemo in Slumberland, which pretty much every regular Narbonic reader should know. 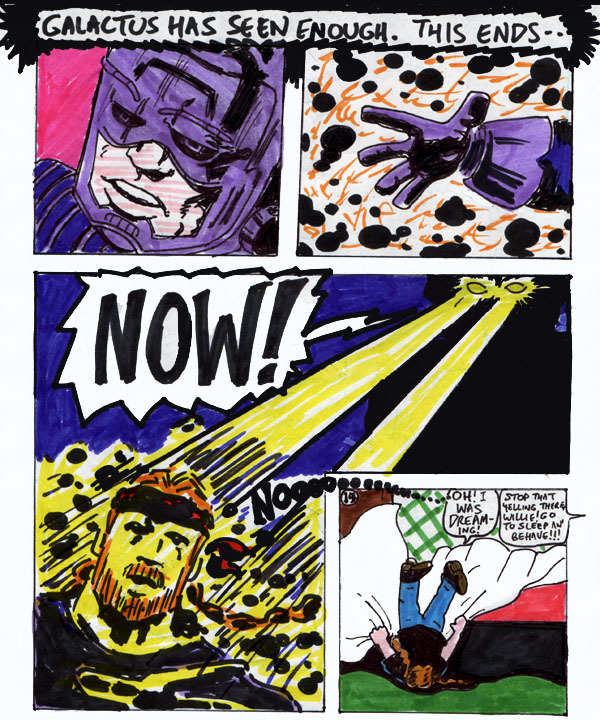 And rounding things out, a badly-colored rendition of the best comic idea that Shaenon and I ever had (collectively, anyway), T-Nuts. 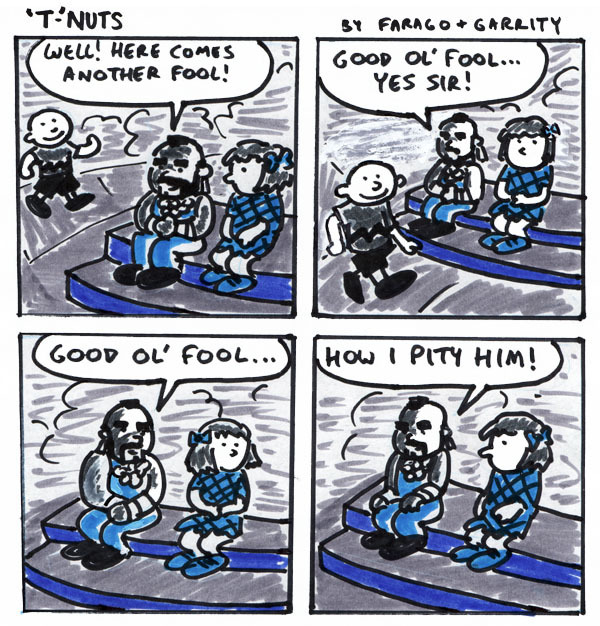 Combining Mr. T and the very first Peanuts strip ever–how can you go wrong with that? So, yay! I can finally tell you how great it is. 😀 It is pretty darn great! OK, two of these made me LOL. And I don’t LOL lightly. 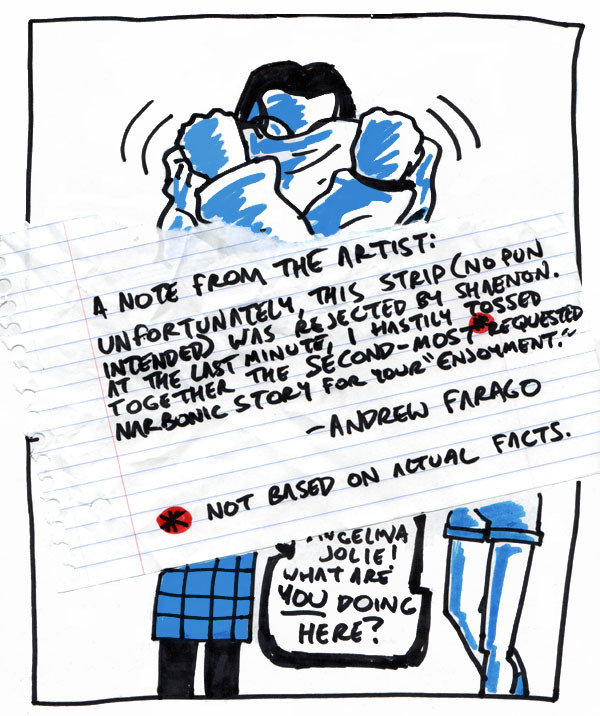 Despite ten pages of unreasonably full-on guest strips, you’re also giving us this on the same day. How generous! Having missed the 80’s, I really should NOT be laughing so hard at this one.